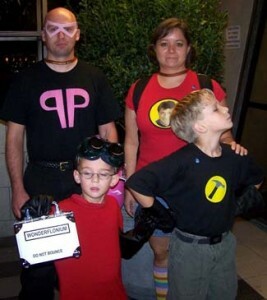 Cartoon character costumes can be easy, inexpensive, and are very recognizable. Conventions are a great place to meet up with friends and dressing up can make it even more fun! Attending a convention can also make a memorable family vacation, but finding costumes that work for friends and relatives of different ages can be challenging. Most group costumes can easily be expanded or reduced to accommodate the size of your group while still feeling complete. 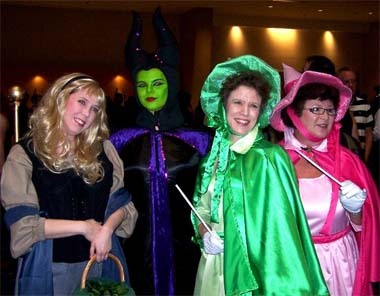 For example, cosplayers with a Wizard of Oz theme could work with the four main characters (Dorothy, Scarecrow, Cowardly Lion, and Tin Man) or the group could be expanded to include Toto, the Wicked Witch, Glinda, and as many flying monkeys or munchkins as needed. You can also group together characters from different worlds with a theme, such as horror movie killers (Michael Myers, Freddy Krueger, Jigsaw, Leatherface) or famous vampires (Dracula, Spike, Edward Cullen). 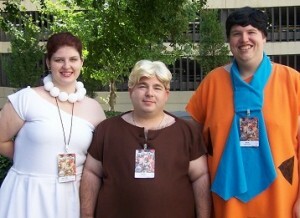 Below are a few ideas to get you started thinking about group costumes for friends or families. The ages of the characters and cosplayers don't have to match. Look at how adorable a tiny Dr. Horrible and Captain Hammer are! Lovely group of Sleeping Beauty cosplayers. If you’re looking for costumes for two, we have you covered with a list of over 100 ideas for couples of all genders. Please share other ideas or photos of great group costumes in the comments!